Hey Corey, no problem! The place is certainly spread out. I did run into Rey & Co, too, as they were checking out their next SUV Certainly a less diverse set of vehicles this year. Crowd seemed a bit smaller, too. Nevertheless, entertaining to walk around and see some of the new stuff. 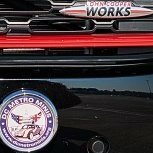 Event Title: 2019 Washington Auto Show Event Date: Sunday, 7 April 2019 Event Address: Walter E. Washington Convention Center, 801 Mount Vernon Place, NW, Washington DC, 20001 RSVP on the event here: As a club for automotive enthusiasts, it seems natural that we spend a day drooling over cars in one of the few large automotive shows still in existence in North America. There are two weekends in April that are available, but I'm tentatively picking April 7. Would love to have feedback by March 16 if you would like to attend this day, or another. Other possibilities are 6 April, 13-14 April. Due to the many different ways to get to the Walter E. Washington Convention Center and the difficulty we'd likely face if we tried to drive as a group, this will be a non-driving event. We will meet at the auto show. More details to follow as the date nears... Ticket prices are posted on the web with various possible discounts, BUT... the show director has said that we can get a group discount ticket rate of $8.50/person if we have 25+ people attending. Cheers, Stephen (BendersMINI) ----------- "Designated one of the nation’s top five auto shows by the International Organization of Motor Vehicle Manufacturers, The Washington Auto Show®, a world class event, continues to wow audiences with its cutting-edge exhibits, latest model cars and displays of historic vehicles. As the “Public Policy Show” on the auto show circuit, the 10-day public show is preceded by two Public Policy Preview Days of special events and announcements for officials in government, industry and the media. The Washington Auto Show is also the largest public show in Washington, D.C. Over the course of its many years this beloved and historic D.C. tradition has attracted Washingtonians of all stripes – and political affiliations. Visitors enjoy the annual trek to the Walter E. Washington Convention Center for the entertainment, as much as for the experience of viewing the hundreds of cars on exhibit. Along with the engineering prowess on display among the more than 600 new models from over 35 manufacturers, the 2019 show will feature VIP tours led by award-winning automotive writers and a special exhibit area for live painting of “art” cars. As a bonus, there will be onsite visits from celebrities and sports personalities! Notice: Attendees are encouraged to arrive early as the Washington Auto Show has instituted a standard security policy for all show days at the center. Patrons will be subject to search and possible hand held metal detectors. All bags, briefcases, book bags or items similar in nature will be searched as patrons enter the arena. The Washington Auto Show consults with local law enforcement agencies on a continual basis. Some of the security measures in place will be apparent to patrons and some will not." meatballs it shall be Just me coming, I think. Similar thought to Rey... meatballs in sauce with some buns... or maybe I'll bring some sort of chicken/rice stew. Welcome to our newest vendor! We're very fortunate to have OutMotoring join our great roster of vendors that offer discounts to members of DCMM. OutMotoring is one of the early aftermarket suppliers of parts for modern MINIs and has remained a steadfast supporter of the MINI/Mini community. I've visited the shop in person on a couple of occasions (once during MOTD, another while passing through the area) and have thoroughly enjoyed the customer service, extensive selection, and kid-in-a-candy-store feel of exploring their shelves! I can't count how many times I've ordered online... 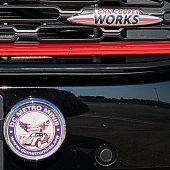 Here's the company description in their own words: **** At OutMotoring, we specialize in MINI Cooper Performance Parts and Accessories and Aston Martin parts and accessories. We're a family-owned business founded in 2002. We want to be your #1 source for MINI Cooper (Countryman, Clubman, Convertible, Coupe, etc) and Aston Martin accessories and parts, so we offer a wide selection, great prices, fast shipping, friendly service and regularly add new MINI Cooper parts to our online catalog. Be sure to check out our fantastic Motoring Points Rewards Program to earn points to get MINI Cooper parts for FREE! **** As usual, vendor benefits are for DCMM members only. You can find the vendor discount code in The Clubhouse section of the forum, under the Out of Area Vendors thread. Starting to upload pictures into the MTTB10 album in the gallery... hopefully that's the right place.